The Complete Flock at the New-York Historic Society, an opportunity to see all of John James Audubon’s original drawings for the Birds of America over the course of three years, has been a spectacular exhibition of Audubon’s art and genius, but also a learning experience for the thousands who have visited the N-YHS galleries. 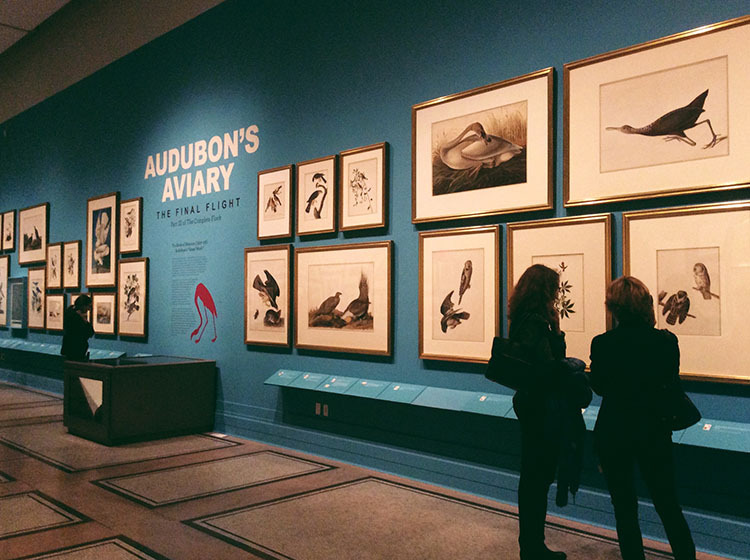 The exhibition has something for everyone from the novice, who is seeing Audubon’s work for the first time, to the seasoned Audubon scholar coming to study and re-study Audubon’s detail and finesse. 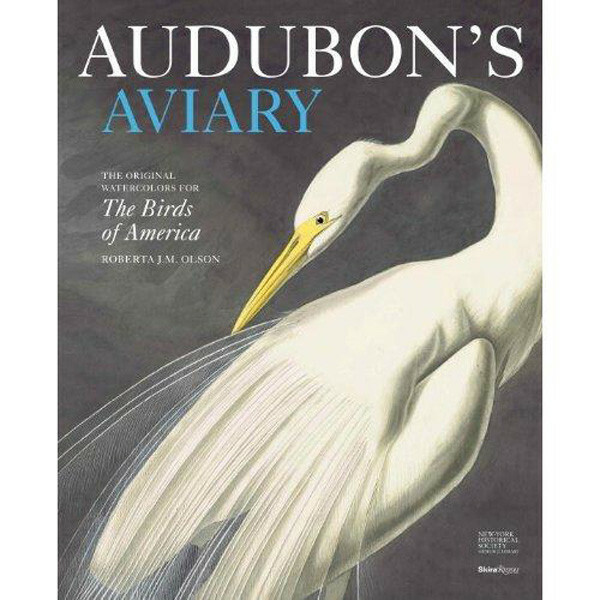 The accompanying book Audubon’s Aviary has become the benchmark for chronicling and interpreting Audubon’s masterwork. 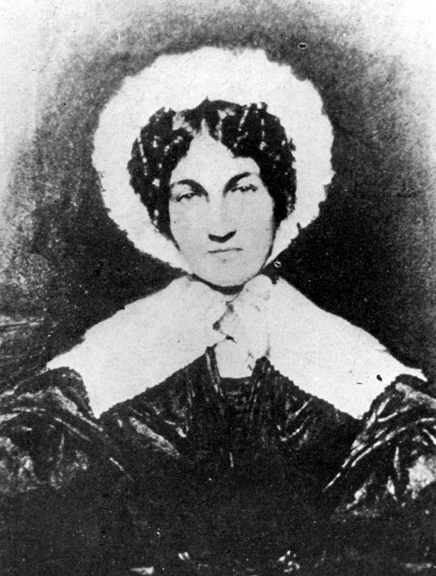 As I prepared to see “The Final Flight,” this year’s installment during JJA’s two hundred and thirtieth birthday anniversary, I asked Dr. Roberta J. M. Olson, Curator of Drawings at the New-York Historical Society, as well as curator of The Complete Flock and author of Audubon’s Aviary, if she would answer a few questions about putting the exhibition and book together, working with the drawings, and engaging with Audubon through his work. She graciously consented, so following is a Q&A we had about this American master. 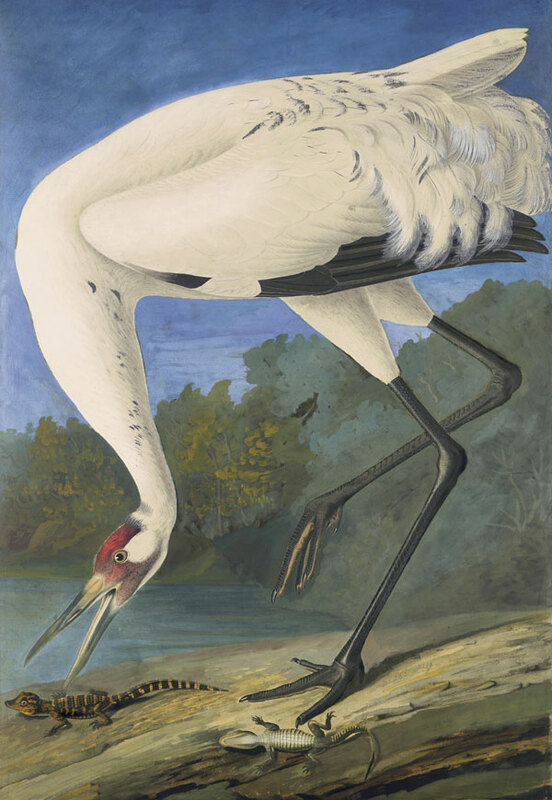 Dr. Olson’s responses give insight into Audubon the man and his masterpiece, as well as the intense study and preparation that precede mounting an exhibition of this scope. Reading her comments is an excellent introduction to viewing this final installment, which is open through May 10, 2015 at the N-YHS. MS: Take us back to the beginning of the exhibition, Roberta. How did the idea for The Complete Flock germinate? Did you start with the idea for the book or with the exhibition or did it all come to you as one grand idea for celebrating JJA’s legacy? RO: The project had a lengthy gestation, as you might imagine, worthy of Audubon and his decades-long project for The Birds of America. Its genesis can be traced to when I guest-curated an exhibition at the N-YHS in 1989-90, while I was on sabbatical from my teaching at Wheaton College in Massachusetts but living in NYC. At that time, N-YHS conservators were working with some of the Audubon watercolors, and I was invited to take a gander in the conservation lab. I was never the same after seeing these watercolors. While I was acquainted with Havell’s amazingly complex prints, nothing had prepared me for the range, the scale, and the magical experimental media and vignettes of birds that seemed to fly off the page. I have always characterized Audubon as the American Leonardo, because he combined art and science and did so with a profound understanding of all the contradictions of life. Like Leonardo, his subjects breathe and think and act before our eyes and seem to have a life of their own that almost continues off the paper. When I came back to the N-YHS as Curator of Drawings in 2000, the watercolors were, so to speak, under my wing. You know the N-YHS has all 435 watercolor models preparatory for the 435 plates of Havell’s engravings for The Birds of America (1827-38). They were purchased directly by subscription from Lucy Bakewell Audubon in 1863, together with alternative studies of birds and mammals for a total of around 500 watercolors. At the time the mission statement of the institution also called for collecting natural history as there was no American Museum of Natural History. Then in 2003, I organized my first Audubon exhibition The Birds of Central Park to celebrate the sesquicentennial of the Park. This led to a series of small “Audubon’s Aviaries” (Spring of 2004-2009) consisting of around 40 watercolors. Our President, Louise Mirrer, asked to hear the birds sing, so we arranged for a program of audio flyovers and motion-sensor-activated bird calls and songs for selected watercolors. 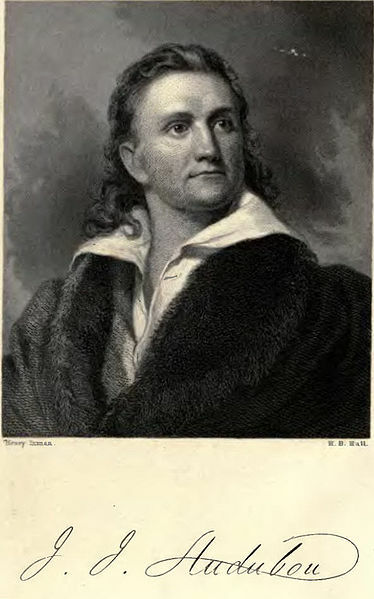 Since one-third of all bird identifications are made on the basis of sound—calls or songs—it was a very intelligent suggestion and one that JJA would have approved of, as in his Ornithological Biography he phonetically reproduced many of the calls and songs of various species—he was very musical. The exhibitions were a hit, especially with birdwatchers. 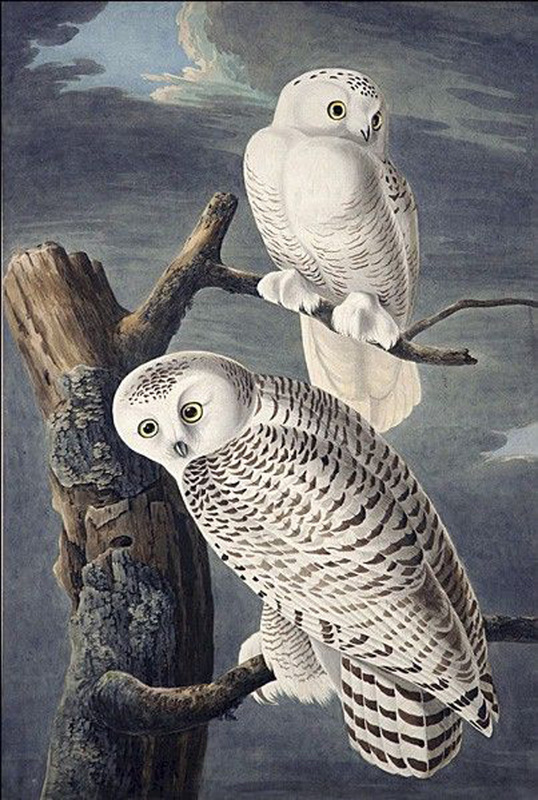 Audubon’s art is, of course, magical. Concurrently on a grant from the Getty Foundation, I was cataloging the over 8,000 drawings and watercolors in the Historical Society’s collection, which was a labor of love and afforded an opportunity to examine thoroughly with magnification and in the lab without glass or mats the media, inscriptions, etc. of all of Audubon’s avian watercolors. It was like having a daily conversation with him, enlivened by the charming, intelligent voice of his inscriptions. The watercolors are works-in-progress and very immediate and one can see the changes he made as well as his innovations—up close and personal. All the while I was researching the book Audubon’s Aviary: The Original Watercolors for “The Birds of America.” People’s questions and a continuing dialogue with Audubon’s works pushed me further and further into ornithology and a desire to plumb the depths of Audubon’s work and contributions. I did not just want to repeat all the stock ideas and clichés about him and his work, but rather to scientifically study the works and the ideas behind them within an historical context. Some sleuthing, traveling to La Rochelle and Nantes, and keeping my eyes open yielded great discoveries that I also published in a series of articles. It also encouraged me to grapple with how Audubon devised his magnum opus and distributed it, as well as how he invented his various use of media, including collage and rendering every barbule of every barb in shimmering graphite to simulate how light reflects off feathers. You know he was the first to reproduce all his birds life size—he was a realistic dreamer, a visionary. MS: One of the most interesting parts of the exhibition for me is that you’ve presented the Birds in the order subscribers received them, so we can see how Audubon grouped his birds for dramatic effect to keep his customers engaged. That’s a very logical approach, but it’s not the usual one of presenting the Birds by taxonomy or some other organizing method. When did you make that decision? Was it early in the process or an idea that germinated during the planning stages? RO: Early on Audubon was criticized for organizing his watercolors for Havell to engrave in fascicles of five for the double-elephant folio edition not by taxonomy of species, but rather in the order he deemed his studies were completed. According to him it was “like nature.” This was pure genius. If done taxonomically, they would have had months of sparrows and seagulls and subscribers would have been bored and probably have lost interest. That said, he carefully calculated that the Wild Turkey would lead the flock. In the later octavo edition, he increased the number of birds, but also organized them taxonomically and included sections of his text of “Bird Biographies” (Ornithological Biography) so that it resembled more a field guide. In the exhibition I wanted to show visitors the reason why he did this. All good ideas enter intuitively and this one came to me gradually over time. It was the only way to continue learning about Audubon and his work because the works are so large you cannot even stage this in the lab. For me it was an exploration, an adventure, not unlike JJA’s rambles. The panoramas presented in the trilogy of The Complete Flock have provided new illuminations that continue to bombard me on a regular basis. MS: Following up on that question, what were your considerations in displaying the drawings? I’m particularly interested in how you chose the frames, which are so elegant, but also so very simple. They give cohesion within each installment of The Complete Flock, but also among the three parts. MS: Each time I’ve gone to see The Complete Flock, I’ve learned something new about JJA. Sometimes, that’s a detail in a painting and other times it’s just seeing so many birds together, each painted in its own environment and showing its character, as a window into JJA’s creative process. How do you think The Complete Flock has increased understanding and appreciation of JJA’s work? RO: I also learn something each day I enter the exhibition. It allows people to see him as the great artist he was and have an understanding of the true scope of his work. They appreciate him as a real and complex individual not just an icon and take his art seriously. When I first began this quest, people would ask me whether he was an artist or a natural scientist? They don’t ask me anymore. They see him as a paradigmatic role model who dedicated himself and against all adversity triumphed and kept reinventing himself. They also see him less of a stereotype than before and realize how he came to be the poster child of the National Audubon Society. Most of all, they buy into his vision of preserving our environment and species and weep with him over the loss of wildlife, wetlands, and prairies. Everyone wants a patron saint for a cause and he is an ideal candidate. He, his art, and his life have much to teach all of us about the time we spend on this earth—to use it well. MS: As a follow up, what would you like the first-time viewer to take away from visiting Part 3 of The Complete Flock? RO: To become infatuated and inspired with the beauty and power of nature, and leave thirsty for more Audubon and to harness his energy and apply it to their lives. MS: Before you started the project, you had a long relationship with the Birds in your role a curator, but I’m sure that even for you, new details or facts emerged during preparations. What surprised you most once you had embarked on the project? RO: I could finally answer the question of one visitor: “Are there any birds from his early French period—before coming to America in 1803?” I said I didn’t know of any, but then found one. Eureka! MS: The exhibition is splendid and beautifully done, but as in any institution, you must have had budgetary restraints and with art you always have conservation constraints. Can you give insight into how either or both affected your choices in preparing TCF? RO: Thank you!! Always but like JJA, who always worked within limitations, one of the secrets of his success, you find avenues and ways of making your vision work. There are seldom easy answers but there are paths. MS: And, as a follow up, if you were to start over at the beginning, would you do anything differently? If so, what? RO: Impossible to answer—it has been an adventure! But I would have like to have had the opportunity to spend more time in the Aviary. MS: After engaging with The Complete Flock so long and so intimately, which one of Audubon’s birds stands out for you as his most and least successful. RO: I cannot answer which is most engaging for me—it depends on the day and how you approach each watercolor—they are all so different which is why they are so mesmerizing—he got to the essence of each species through being embedded in their habitat with them, dissecting them, measuring them, describing their habitats, and yes, tasting them. Certainly 85 % fall into the high points with another 13 % intriguing, depending on JJA’s constraints. Only a few don’t represent his best attempts. Sometimes it was just a bad day or series of days or lack of real specimens. MS: The Great Egret is the iconic image that represents The Complete Flock. The image itself appeals to modern sensibilities, and many might consider it one of JJA’s most beautiful compositions. Presumably, JJA thought it was less appealing. What are your thoughts on his assessment? And how do they reflect changing tastes? RO: He deemed the nocturnal one too aesthetic and wanted to show his credentials as a naturalist. I write about this in Audubon’s Aviary. A trio of watercolors reveals Audubon’s decade-long struggle over this challenging characterization. 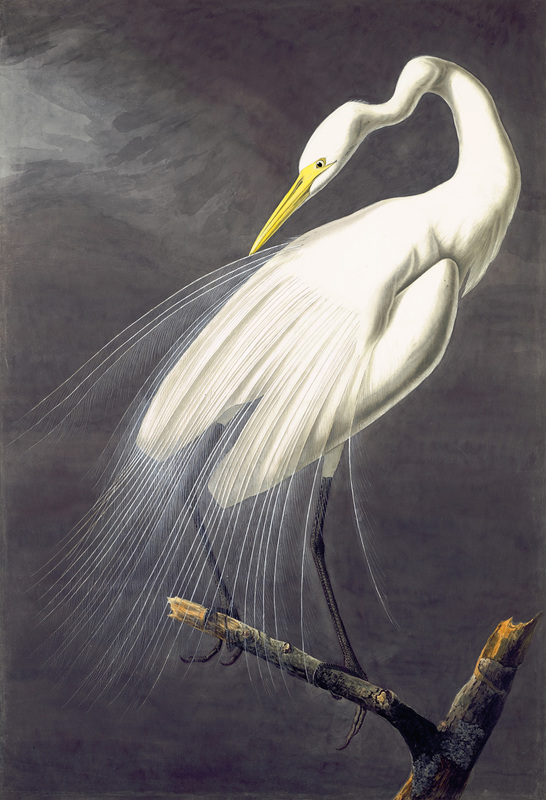 He confessed that the Great Egret was “the most difficult to Imitate of any Bird I have Yet undertaken.” In 1821 he painted his first attempt in New Orleans, the other two in 1831–32 in Charleston. All three feature males in breeding plumage. The artist’s initial vertical composition (comparative figure) places the bird against a nocturnal sky, preening his starkly white plumage. The second (1863.18.29) is a horizontal composition that stresses the bird’s habitat and behavior with the mud chimneys of crayfish, its preferred food, but retains its backward-looking stance. JJA never finished his second version, turning instead to the third in which he drew the bird’s neck in an S-curve as it strides forward, plunging down to feed. Still not pleased with the head, Audubon repainted the area on a collaged piece of paper. JJA preferred his final version because it underlined his natural history credentials. MS: Leaving JJA and The Complete Flock after your long preparation for the book and exhibitions must be bittersweet. On the one hand, you and the N-YHS have given the public a once in a lifetime opportunity to see this remarkable body of work in its entirety. On the other, the approaching end of Part 3 must feel a little like saying goodbye to a close friend. Could you share your thoughts on that? RO: You have chosen the best word “bittersweet.” But like JJA, the energizer bunny, there is a signal light on the horizon. When the newly renovated Luce Center opens in late 2016 there will be a new challenge and a section where the preparatory watercolors can be displayed with their corresponding Havell plates, with both changing every month. In 435 months visitors can see them all. No other institution in the world can mount this, but NYHS believes that we need to share this national patrimony with everyone. MS: Finally, after living and breathing The Complete Flock for the years leading up to the exhibition and during it, what three things have most dazzled you most about JJA’s life and art? RO: The profundity and breadth in his ambitious life and enterprise and the pleasure it affords others. His art really makes people think and sparks insights and creative ideas. You can see the lightbulbs go off and the energy surge as visitors get involved with Audubon’s art and story. Like his birds, he was a man for all seasons and ages. I am looking forward to exploring more Audubon territories in the future! 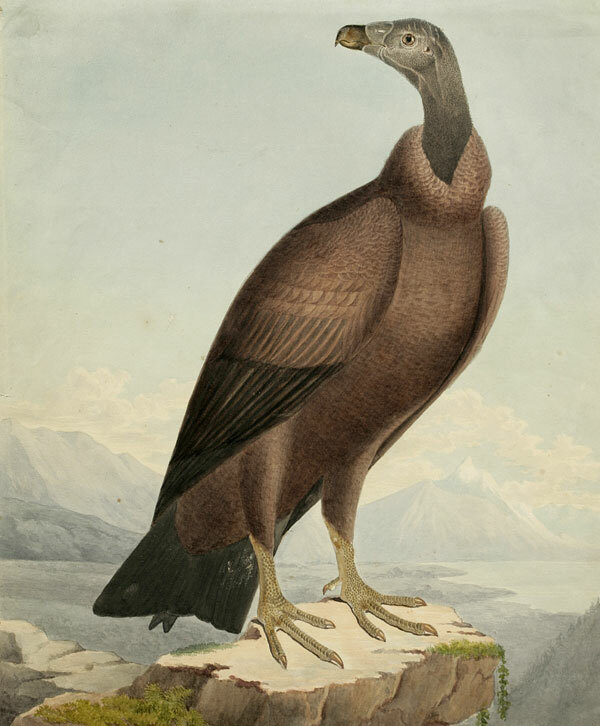 The Cinereous Vulture was with the Audubon material that the N-YHS purchased from Lucy Bakewell Audubon in 1863 with no artist’s name attached to it. It lived with the Audubon drawings under his name. Dr. Olson realized it was not Audubon’s work and has re-attributed it to MacGillivray. Audubon taught MacGillivray watercolor techniques. An unfinished version of Audubon’s Louisiana Heron seems close in style to what MacGillivray might have produced when copying it. (Audubon also had Maria Martin duplicate this watercolor as a pedagogical experience sometime after 1830.) The Scot learned to execute beautiful watercolors like Audubon’s, albeit with a generally grayish, more pastel palette and flatter forms. Posted in John James Audubon, New-York Historical Society, Roberta J. M. Olson PhD, The Complete Flock. Bookmark the permalink.